LA Pai Gallery, in Ottawa, recently hosted their student competition winner solo exhibition, Futur Composé by Anne-Sophie Vallée. 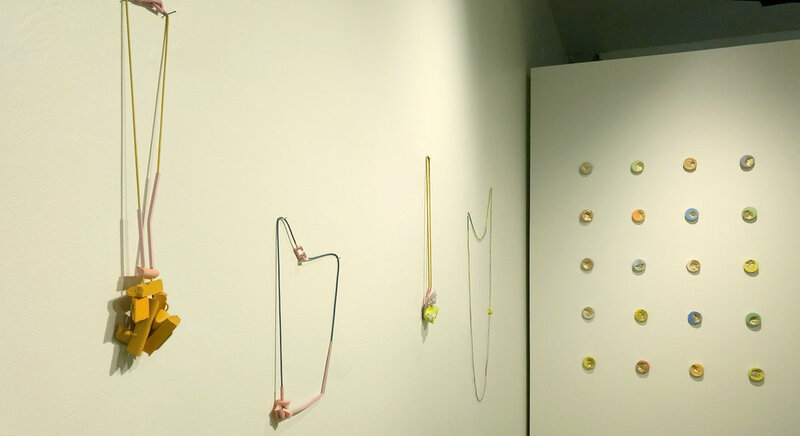 A recent graduate from NSCAD University’s Jewellery Design and Metalsmithing program, Vallée had also been a finalist in the same competition a few years back, when she graduated from the École de joaillerie de Montréal, in 2011. Anne-Sophie Vallée has now been navigating in the field of jewellery for about ten years, and has since then shown her work all across Canada and abroad. Nestled at the back of the gallery space, the exhibition Futur Composé immediately invited the viewer into an intriguing fantasy world full of unexpected colours and textures. Soft pinks and yellows would waltz alongside deep blues and neon greens, all in a harmonious yet quirky and playful way. Vallée’s use of colour and textures seems to have taken a whole new direction with this body of work, which was influenced by the concept of material vitalism. Using gypsum cement as a main material, Vallée’s pieces seem to suggest the aftermath of an explosion, a drip, a fracture. She implies, through the work, that matter has a life of its own, “investigating scale, mass, gravity and movement all of which are inseparable from time”. The body of work presented in Futur Composé was in a way unexpected, given Vallée’s previous work, but seemed completely natural at the same time. What appears to tie all of Vallée’s work together is a constant sense of spontaneity and openness to the unknown and the unforeseen. Jewellery as an object imposes certain constraints in terms of scale, weight and wearability, just to name a few, and it is obvious that these aspects are major concerns in Vallée’s process. What is most impressive is how she seems to find a way, through her work, to finely balance this search for accuracy with complete freedom in allowing for the unexpected. Anne-Sophie Vallée was kind enough to share with us some insights on her thought process and the development of her latest body of work. Where did your interest for the concept of material vitalism come from? I was introduced to the concept of ‘material vitalism’ elaborated by philosopher Henri Bergson through a book called Vibrant Matter, by author Jane Bennett, which exposes diverse approaches to material and things. To me, the book is of great interest for artists and makers regarding subject/object theory. From a scientific point of view, material should behave a certain way in specific given conditions. Nevertheless, experiments have always shown a percentage of unpredictability, as if the matter itself responded to its inner energetic impulse. I wanted to work within this perimeter described as ‘material vitalism’. In my previous work, I developed an interest for participation and I intended to translate this idea to the relationship you develop with jewellery you own or interact with. This time around, I was interested in how the material participates in the work itself. Your previous body of work was mainly composed of powder coated steel pieces, and here you are working mainly with gypsum cement. What kind of role does the nature of materials play in your work? I believe the choice of material is a powerful way to convey meaning. This is one of the reasons the use of material is so diverse in the field of art jewellery. Also as a crafts-person and a jeweler, I am always aware of function and the choice of material needs to serve the idea and the result. In this case, the materials’ characteristics and limits will have great influence on my decision. My past work addressed the wearer’s participation in the work’s final form and function. A mass of articulated colored steel wires would move and reveal as many forms and compositions one could activate by playing with the object. I chose steel for its light weight and also its magnetism. In this body of work, I wanted to talk about form as a language. Craft is often criticized for its lack of theoretical discourse, so I wanted to defend its effectiveness at transmitting ideas. Craft objects and materials are already loaded with meaning. It is content we can’t ignore when contextualizing our work. This time around I wanted to explore wet mixing media and its response to molding and layering. The material fluidity allowed for exploration of inner and outer forces and the usable working time was crucial in producing accidents. In the end the material is the intermediary between the maker and the viewer. Is the process of making important to the concept or idea you are trying to put forward? Definitely. I see the process as a set of actions and the work, as a result, carries this information as a type of language. I wanted to stress the fact that craft has a language of its own that is different from theory and that this allows for great latitude in expressing abstract ideas. Would you describe your process in creating the work as spontaneous? I think spontaneity is an attitude. At a human level, it is a good way to get to know your authentic self. As part of an artistic process, I think spontaneity can be used to investigate both the material and the self. The more I detach myself from my rational mind, the better I am at connecting bodily energy with matter. Unexpectedness feels like real discovery and translates a search for freedom, which is essential to my work.